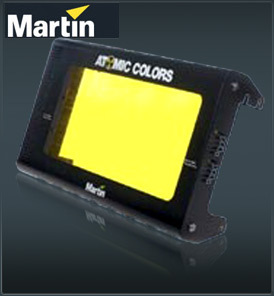 Martin Atomic Colours is a specially designed head which fits onto the front of the Atomic 3000 DMX – allowing up to ten brightly colored strobe and blinder effects. Creating an array of colored opportunities for your Atomic 3000 DMX, Martin Atomic Colours adds a further creative dimension to the blinder and strobe effects of the most powerful and dynamic strobe light on the market. The Atomic 3000. Easily attached with quiet running operation, Martin Atomic Colours is an effortless plug and play fixture, directly controllable via DMX 512-USITT controllers and to be used in combination with The Detonator, (the special developped DMX controller to the Atomic 3000). The Martin Atomic Colours comes with one string containing 10 colors plus clear. We also offer the possibility of custom made color gel strings – but with a little longer delivery time. The Martin Atomic Colours is cable connected to the Atomic 3000 DMX with an external power supply: MPU 02 / MPU 08.